Despite the promise of seeing Pete Campbell begin his slow metamorphosis into Ted Knight from Caddyshack, last night’s Mad Men was the series’ lowest-rated premiere since 2008, drawing in just 2.3 million viewers. While the show has never been a huge hit, that’s just barely ahead of the 2.06 million who tuned in for the start of season two—and much further down from the 3.4 million who tuned in for the premiere of season six—while its ratings in the 18 to 49 demo dropped from 1.1 to just an 0.8. In short, it seems Mad Men’s numbers are receding like a hairline that you could just prop some sunglasses on, seriously, no one will notice. Because this is Mad Men, naturally this drop-off will give rise to all sorts of theorizing. 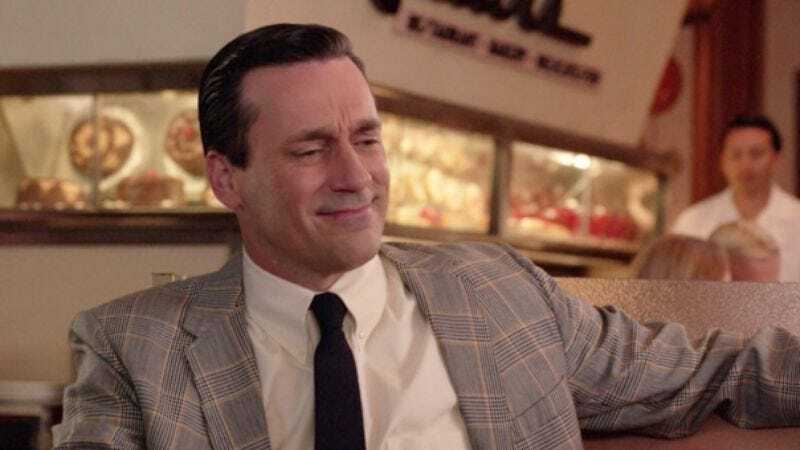 First and foremost, it’s possible AMC’s decision to split Mad Men’s “final season” in two—a move that paid off with a surge in viewership for Breaking Bad—is having the opposite effect, turning off those who resent being made to wait another year to see the whole thing play out. It’s also possible that the show is simply becoming less “appointment television,” and that once DVR numbers are factored in, it will see an even bigger gain in replays than in previous years. Or perhaps that “2.3 million” is a cryptic reference to the connection between the number 23 and Charles Manson, once again definitively proving that Megan is Sharon Tate. Of course, another potential factor is that Mad Men has faced some increasingly stiff competition year to year, and last night’s Game Of Thrones—which drew 6.3 million viewers in the hour just before Mad Men aired—was one that might have consumed a lot of their shared audience’s energy. (As well as the rest of their night, as they spent it watching Twitter freak out instead.) Whatever the reasoning behind the dwindled numbers, AMC has put an ad man’s positive spin on them, pointing out that they’re still about on par with the sixth season’s average viewership, and proudly proclaiming that Mad Men remains “the most upscale show on ad-supported television among adults 18-49.” And if Mad Men has taught us nothing, it’s that being upscale makes you immune to life’s disappointments.